The largest annual humanitarian assistance and disaster response exercise involving the Bangladesh government and the US army has begun in Dhaka. 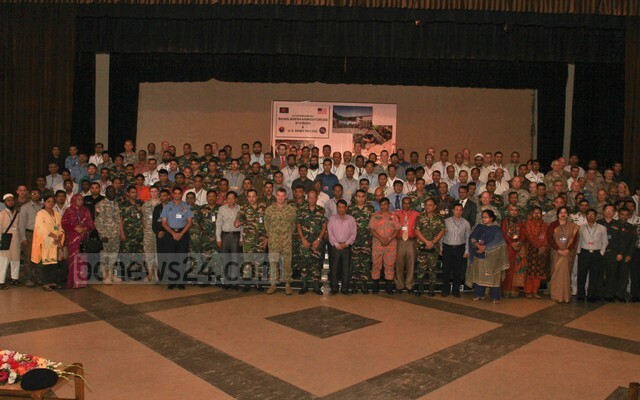 Known as ‘Pacific Resilience’, the five-day exercise would review and evaluate Dhaka City earthquake response plans, practice logistical and medical emergency scenarios, and identify current gaps in plans and procedures. This was also aimed at increasing coordination between emergency management and aviation stakeholders and assessing foreign humanitarian assistance procedures in Bangladesh. Principal Staff Officer of Armed Forces Division Lieutenant General Md Mainul Islam, secretary for disaster management and relief Md Shah Kamal, and Deputy Commanding General (operations) of US army pacific Major General Gregory Bilton inaugurated the event on Sunday at the Army Golf Club in Dhaka. The Pacific Resilience is a series of exercises throughout the Asia-Pacific region that ensures that the US is prepared to assist its global partners in any major disaster, the US embassy said. It involves the civil administration and media to ensure civil-military integration for humanitarian assistance and boost disaster response capabilities. In Bangladesh it is believed that if a 7.0 Richter scale earthquake strikes Dhaka, at least 70,000 of the city’s 350,000 buildings will collapse. The exercise will be located at numerous places including the airfield at Tejgoan where they will conduct simulation of loading and off-loading relief materials from the aircraft. Beginning in 2010, this is the sixth of its kind annual engagement between the US army’s Pacific Command and the Bangladesh government. More than 150 participants are taking part in a phased table-top exercise and 350 will participate in a field training exercise. Major General Bilton at a press briefing after the inauguration said the purpose of the exercise was to respond to disaster “more effectively”. “Its (exercise) all about building capacity and also about providing a reassurance to the people that as and when disaster strikes, we can respond very effectively and in a coordinate way,” he said. He said the exercise involved those with whom they would work together during disaster relief, particularly the civilian counterparts. Brigadier General Azazul Bar Chowdhury, director general, operations and plan directorate, and joint secretary of the disaster management relief ministry Md Mohsin were also present at the press briefing. This year’s exercise, however, will take stock of lessons from the Nepal disaster response in a session. Captain in the US army Craig Talarico, bilateral affairs officer, told bdnews24.com on the sidelines that the issue of custom clearance which was a big challenge in Nepal after the earthquake had been included in this year’s exercise. He said setting up communication system after the disaster would also be focussed in this year’s exercise that ends on Sep 3.